The United States is looking at a second summit between President Donald Trump and North Korean leader Kim Jong Un after receiving a request for such a meeting in a letter from Kim, the White House said Monday. The purpose of the letter to Trump was to "request and look to schedule another meeting with the president, which we are open to and already in the process of coordinating that," press secretary Sarah Huckabee Sanders said at a news briefing. Speaking to reporters separately, national security adviser John Bolton said it is "entirely possible" for Trump and Kim to have a second meeting by the end of the year following their historic summit in June in Singapore. Bolton said the United States does not think Kim will attend the U.N. General Assembly later this month, suggesting there will be no Trump-Kim meeting in New York. But Bolton said the possibility of a second summit "being later is always there," possibly on the sidelines of the East Asia Summit slated for November in Singapore. "We're entirely in hypothetical territory at this point," he added. 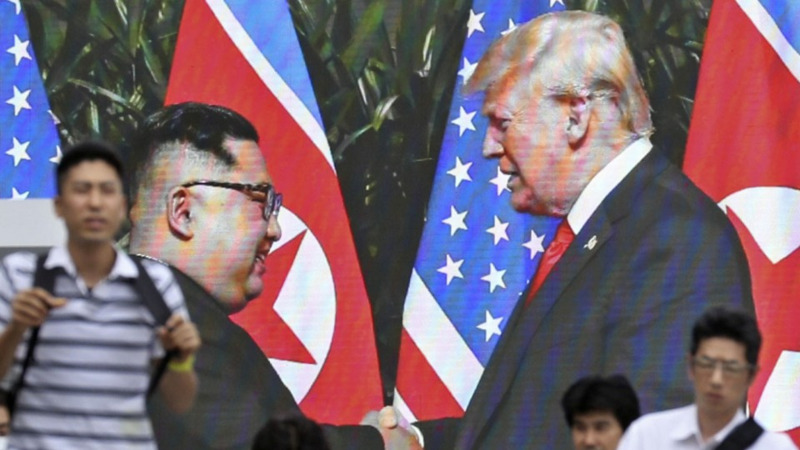 The development came amid stalled bilateral negotiations over how to denuclearize North Korea. Sanders did not say when or where a second summit could take place. "We'll let you know when we have further details, but it's certainly something that we want to take place," she said. Asked about the absence of intercontinental ballistic missiles capable of hitting the United States in a military parade North Korea staged Sunday, Sanders said, "We consider that a sign of good faith." Kim's letter, which she called "very warm" and "very positive," will not be released by the White House without approval from the North's leader, Sanders added. Last week, Trump said he expected to receive a "positive letter" from Kim, without providing details. In the first-ever U.S.-North Korea summit, Kim committed to "complete" denuclearization of the Korean Peninsula. But Pyongyang has yet to provide a full inventory of nuclear weapons and fissile materials, as Washington has demanded. Nor has North Korea presented a road map for denuclearization, except for Kim saying recently he hopes to achieve denuclearization before the end of Trump's first term in January 2021. The North, for its part, has insisted that the United States first declare a formal end to the Korean War, which was halted with an armistice rather than a peace treaty in 1953.